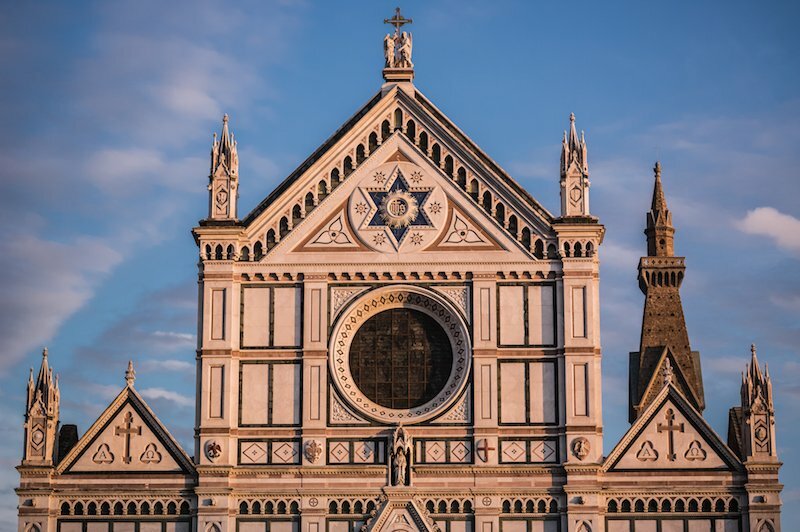 Florence is best known as a tourist destination in the summer – the Uffizi, the Duomo, the Ponte Vecchio – and a menswear hub in January and June, when it plays host to the men’s trade show Pitti Uomo. But it has enough unique shops to make it worth a visit any time of the year. The city has always had a large population of artisans, particularly for paper and leather goods, and some of Italy’s best tailors and shoemakers reside in the city today. The perfumery Santa Maria Novella has a case for being the most beautiful shop in the world. Founded by the church’s Dominican monks, it sits in its own, magnificent section of the basilica, complete with ornate frescoes and paintings charting the history of the family. There is a selection of fragrances, soaps, creams, liqueurs and several other ways to perfume the house and body. Florence’s best-known bespoke tailor cuts a flattering and surprisingly modern style, with a slightly shorter jacket, rounded fronts and a wide lapels. Although expensive, the work is first rate. There is also a collection of vintage fabric bolts, which are always nice to drape across the body when picking out a suit, and some ready-to-wear and accessories. Since Stefano’s sad passing, the company has been taken over and moved to a beautiful old church on the south side of the Arno. In there, the customer can pick from ready-made shoes, made-to-order and bespoke – with the company’s bespoke craftsmen all work in view around the ground floor. A shoemaking school runs on the top floor. Bemer is now owned by the old Florentine family that runs Scuola del Cuoio, a bag-making school and workshop (above) on the other side of the river in the Basilica di Santa Croce. Although they mostly produce women’s bags, there are some beautiful leather desk sets (supplied to several US Presidents) and the school itself is worth a tour. Florence also has a strong reputation for artisan perfumers, and just down the road from Stefano Bemer is the relatively new shop attached to Lorenzo Villoresi’s studio. Lorenzo creates original perfumes that often stand out for their intensity and impact, and come in beautiful blue-glass bottles. 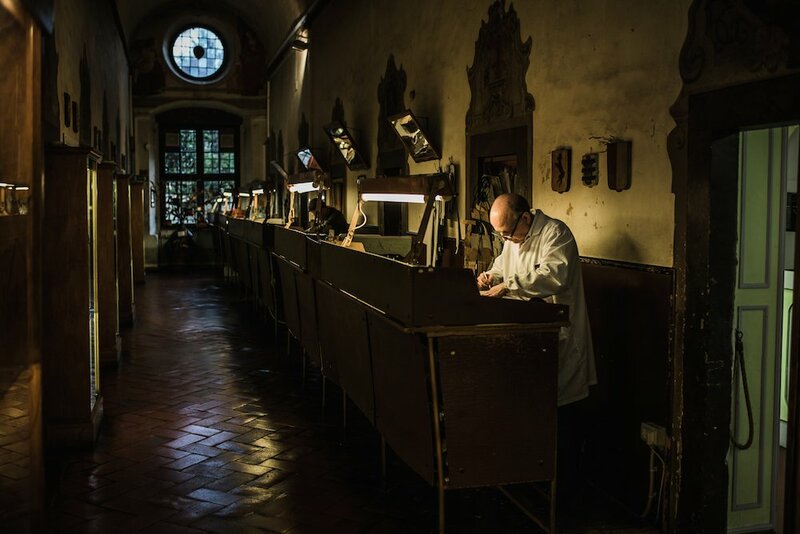 Over the years many Japanese artisans have come through Florence, often training as shoemakers before returning to their home country. One that has stayed and etched out his own, local reputation is Hidetaka Fukaya, known as ‘Il Micio’ (the cat). His bespoke shoes are very finely made, and like many Japanese makers tend to have an elongated silhouette. There is also a small range of leather goods. Just down the street from Hidetaka is the menswear store Frasi, run by Simone Righi. The dapper, bearded Simone has acquired quite a cult following among menswear enthusiasts in recent years, thanks initially to featuring on street-style blog The Sartorialist. The shop is an eclectic mix of accessories and tailoring, with an emphasis on colour and pattern. Also close by is the first-floor workshop of Japanese tailor Kotaro Miyahira, or Sartoria Corcos. Kotaro is a young tailor who has gathered a strong following in recent years, both for his relatively low price and his style – which combines some classic Florentine elements with broader influences. However, at the time of writing he was not taking on any new clients. The other best-known Florentine shoemaker apart from Stefano Bemer is Roberto Ugolini (above). Located on the south side of the river on Via dei Michelozzo, Roberto offers only bespoke. A good range of bespoke designs can be seen on the website. And a third shoemaker worth investigating, particularly on value, is Mannina, founded by Calogero Mannina in 1953 and now run by his son Antonio. His boots and spectator models and particularly popular. There are fewer multi-brand menswear stores in Florence then the other major Italian cities like Milan and Rome, but the stand-out is Bernardo. Although small, it has a well-curated selection of clothing from the likes of Aspesi, Incotex, Herno and Fedeli – all brands that have long been favourites in Italy, but only recently gained followings elsewhere in the world. Milord, another contender for the list, closed recently. Simone Abbarchi is a bespoke shirtmaker that offers great value for money. Unlike many Italians he eschews both aesthetic and functional hand-sewing, leaving an entirely machine-made garment with a great fit and low price (starting at 120 euros). There is a great range of fabrics and he offers made-to-measure knitwear as well. You can follow the discussion on Florence: A sartorial shopping guide by entering your email address in the box below. You will then receive an email every time a new comment is added. These will also contain a link to a page where you can stop the alerts, and remove all of your related data from the site. Antonio Mannina, Madova Gloves, Old England, Michele Negri….. I thought Mannina would have made the list…They make quality shoes at a fair price. What would be the price range for (ready-wear and made to measure) Mannina shoes? Are there any Italian bespoke luggage makers that you could recommend? It’s my (very limited) understanding that Florence is one of Italy’s primary centers for leather production. I do remember hearing about the disparity in quality of Florence’s leather goods, depending upon location, but, what I don’t understand is why that’s the case. I think that this would be a good post topic. On my way to your Mont Blanc post. Eredi Chiarini has a good selection of casual clothes but are perhaps a bit too fond of the ‘hard sell’. Milord, probably the best RTW menswear store in Florence. 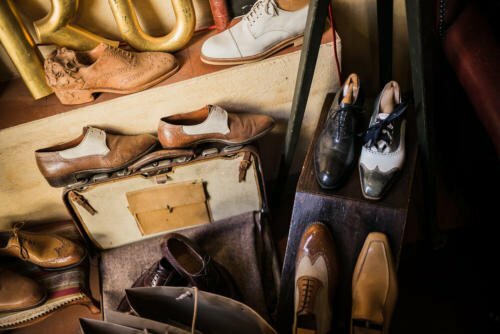 The have a nice selection of various Italian designers, a good selection of Santoni shoes and their house clothes are very nice aswell. I would name Luisaviaroma, for a more fashion forward crowd, and Principe too. Please delete the previous comment. Thank you for finding out, sad to hear. I know that the owner was of advanced age, but this is still a surprise. This also shows, how short lived some information on the internet can be. A change of the owner, head cutter or designer and the whole company change without you noticing at first and even though the outside appearance remains the same. During my last holiday in Italy I wanted to visit a shirtmaker, only to find out that he closed down 2 years ago. The same thing happended in many other cities I visit, often to more recent openings. Hi Simon, just wondering if you have ever been to Genova and whether there was anywhere that similarly stood out there? Where would you go for ties in Florence? The Gucci museum is a surprisingly worthwhile visit – a real focus on the craft, quality and design of the products, from luggage to clothing to shoes. Unfortunately the same can’t be said for Ferragamo. In every Italian city it’s best to simply walk around with your eyes open. Most upscale menswear stores are within the sight of the piazza or the places where to average tourist walks along. Now with bespoke artisans it’s a entirely different story. It may also be a good idea to google brands you look for or ask them for addresses. Once you’ve found one store you can ask the staff for others, in my experience Italian are usually glad if they can be of help. I’m surprised by your asessment of Madova. They have some very nice offerings and are cetainly in line with many exclusive brands. Yes, in Madova shop i found only one budget range – 50 euro all. But if compare simple nappa gloves with cashmere lining from Madova and Merola – no difference in quality (i own both). Thanks, i trust to your expirience. Realy. Wanted to ask what’s the best way to contact Il Micio or Ugolini? Don’t seem to get feedback from the email addresses in their respective websites & I’m not in Italy. Will be flying in & wanted to set an appointment before arriving. Do you have their email addresses? I may be using a wrong one. Simon. I find your sartorial guides excellent reading. So far you have only covered London in the UK, do you have plans for any other major cities, such as Edinburgh, Cardiff, Dublin, Manchester, Liverpool or Birmingham ? Maybe, though I do need to do the major cities of the world first! The key aim of these is to highlight shops worth travelling for, so it’s mostly these cities around the world people might travel to. The emphasise being might travel to. How about revealing some home grown hidden gems first. If you don’t think you could find ten from each City, how about ten from outside London ? Let’s agree to disagree. I’m a heavy user of gloves, so I may look for different things. Reimer’s are very nice though. I would also be happy so see more of these guides, especially for larger Europeans cities. Will you return to Florence? Ugolini has a larger workshop and may have a shorter turnaround time. You can probably walk in both shops and make an order. Planning to go next month but wanted to get an appointment via email first & not risk going there when he’s closed or travelling? Understandable, but I suppose the Ugolini shop also takes orders without Roberto present. I don’t know if Hidetaka’s trainees take orders. I would also recommend you to givel them a call, Italians and e-mail sometimes don’t mix and you may arrive without anyone knowing about your visit. Why not consider the other makers aswell? There is also Mario Bemer, Stefano’s brother, who works with a master trained under Stefano. Porbably closer to an original Bemer shoe than the Scuola del Cuoio shop. Thanks for this post Simon. Just a few questions to ask you: do you know any high-end bespoke shirt maker in Florence? Maybe Leonardo Bugelli? And what about socks? Is there a socks maker comparable to Bresciani? I will be in Genoa for a few days this summer, but unable to really travel beyond 50k or so outside the city. Do you have any recommendations on must visit menswear shops in Genoa? I think you have forgotten about the great bespoke shoemaker Saskia. Also, what about Sutor Mantellassi in Florence. I certainly haven’t forgotten about her. But from what I’ve seen I’d put the other shoemakers here above her. Sutor Mantellasi is available in Florence, Milan and department stores like Harrod’s, so I’m not sure I’d put it down as a destination. I’m not surprised about your anwser. The RTW shoes of Stefano Bemer are much nicer than those of Mario Bemer, but I think for the bespoke operation it’s the other way around. The Japanese fellow, I forgot his name, toghther with Stefano himself was responsible for some of their nicest creations. Still, the differences might be marginal, even though I had the impression that Stefano Bemer has become more sales oriented than the original ever was. Also surprised about you assessment of Saskia. She certainly is on the same level as Ugolini and above Mannina, but below Il Micio and the Bemers. I can absolutely recommend Bugelli, also surprised that he didn’t make the list. Leonardo is extremely accomodating and if you inform him about your visit, he has a very short turnaround time. Stefano Bemer has certainly expanded since it was taken over, but I knew the staff before the change and after, and the same styles and quality are used – being made by the same Japanese girls (well, women) that trained with him. How would you compare Bugelli to Abbarchi since I believe they are both (mostly) machine made shirts? I’m afarid I can’t say anything about that, as I don’t know Abbarchi apart from Simon’s posts. Leonardo is obsessed with good fit and well designed collars, he makes a muslin fitting, pattern maching is also very nice. There is no denying though, that you pay for his name aswell, as he seems very popular in Japan. On the making I must say that most shirtmakers in Northern Italy that I’ve met, swear by machine sewing instead of hand. They say that the shirts last longer, still, my Neapolitan shirts have held up very well. I often wonder if there are more shirtmakers in Florence or the surrounding area, but I haven’t found anyone else. Expanded is nicely put. Upon my last visit to the old shop is was told that most of the show pieces were made by Stefano/ the Japanse master and that the apprentices weren’t this far yet. Comparing the two Bemers myself I’ve had the impression that Mario’s are closer to the originals. It’s also what I’ve hear from customers of both on the whole measuring process, the fittings, the ability to deliver an end product, but I don’t like to engage in hearsay, so I’ll leave it at that. Simon, have you managed to or do you plan to visit Sartoria Piero Cisternino on Via del Purgatorio? Thank you for these lists. I was happy to see Bernardo up there. It was the store that I spent the most (time) at during my last visit and also the one that sort of made me start thinking about opening a store more seriously – like it could actually be done. The size of the store with the storage across the street, even if not ideal at times, it makes a small retail operation seem possible sort of… then again, i have no idea and that is probably the smallest of problems when opening up a store. Thanks for all your hard work in putting these shopping guides together Simon. I will be travelling to Florence this August and was wondering if most of the shops mentioned above (or menswear shops in Florence generally) will be closed during the month of August. I am finding that the best restaurants tend to be closed and am hoping the same pattern of closing during August does not apply to all the shops I want to visit as well. Appreciate any insight if you know. Cheers. Cellerini on Via del Sole makes exquisite leather goods including wallets, briefcases and traveling bags. All are made in their workshop and nothing is exported. Women’s leather goods are wonderful as well. This is an excellent post! Any guide for Rome ? 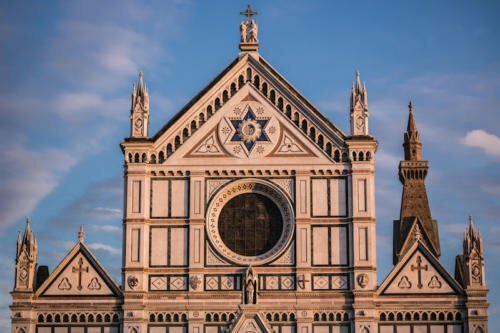 A quick thanks for this guide – I had been travelling in Italy for a few weeks when I landed in Florence. Bernardo and Frasi were both nice shops with kind owners. I bought a very nice inexpensive jacket from Bernardo from Sartoria Latorre. I also had Simone Righi make me a jacket – I am a bit thick but otherwise close to off-the-rack 52 and Simone felt he could make a few changes to the chest and a few other places and give it a go. He had plenty of great fabrics to choose from – we shall see….mostly speaks Italian btw. Simone Abbarchi was again a person happy to show his shop and I ordered 2 shirts to try but really thought his outerwear was worth exploring. Next time. Thanks again the great blog. I found the wooden layout of the shop extremely elegant and their in house production is quite nice and classic.